Her, the movie, is a forward looking near-future film examining the ever pervasive role of artificial intelligence and technology in our everyday life. In the film, heartbroken Joaquin Phoenix falls in love with his female operating system, Samantha, voiced by Scarlett Johansson. 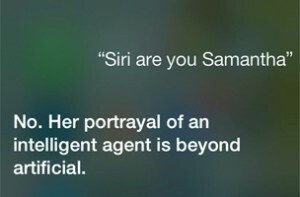 According to director Spike Jonze, the movie Her was developed before the release of Siri, but naturally the resemblance has been drawn by more than just moviegoers. 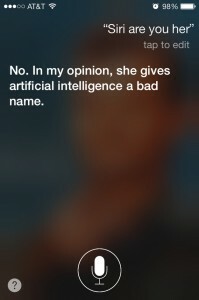 Siri has also taken notice. As reported by Buzzfeed, when users asked about “Her,” Siri has a few snarky, slightly disparaging replies.